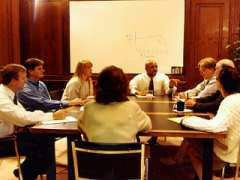 MX3 rents a large variety of technologies and services for conferences, meetings, training seminars, and social events. Examples on this website are the most commonly ordered equipment and requests. MX3's owner has been in conference services for over twelve years and can make your event a success at an affordable rate. MX3 can go into any Hotel, Restaurant, or Conference Center throughout Virginia. Our rates are extremely competitive with any hotel's in-house provider as well as local companies. In most circumstances MX3 Audio Visual will be considerably lower in price while providing superior service. Let MX3 be your next step to making your upcoming event a success.